Hydrowest BBQ Outlets – For Total Patio Comfort! Your convenient solution for all outdoor gas appliances! Forget cumbersome propane tanks, Our BBQ outlets are your maintenance free, simple solution. No need to worry about ever filling, or having to purchase a new propane tank again! Hydrowest Stainless steel gas outlets provide homeowners with simplicity, safety, and reliability. Just turn the Valve and gas is available! When you’re done, turn it off. Simple! Manufactured with rugged 304 Stainless Steel our Natural Gas Boxes are built to withstand a lifetime of use. – Never need to use a propane tank again! – CSA Approved, Automatic Safety-Interlock Shutoff Valve. – Durable and aesthetically pleasing brushed stainless steel finish. – Can be used in many outdoor gas appliance applications: BBQ’s, Patio Heaters, Outdoor Firepits, and Gas-fired Decorative Lighting. – Convenience at the simple twist of a handle! With a gas hose inserted, your natural gas supply is ready on demand! – Available in single or double outlet configuration, for both low- pressure or 2 psi gas systems. – Quick, easy installation by any Certified Gas Contractor. Any time you are dealing with gas appliances, safety should be your first consideration. Our natural gas BBQ outlets safely and securely connect your gas appliances to the natural gas supply in your home. 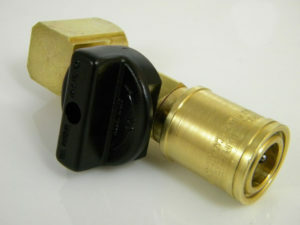 The outlet contains a CSA Approved Quick-Disconnect valve that provides fail-safe, easy operation. Simply push back the locking sleeve, insert the appliance connector, and turn the knob to initiate gas flow. No tools are required for a worry-free and modular connection. Exclusive to Hydrowest, our Stainless Steel BBQ Boxes come standard with a safety-interlock automatic shut-off valve. The safety interlock-sleeve ensures that the appliance cannot be connected or disconnected when the outlet is in the “ON” position. In addition, our boxes are fully fire rated. A built-in thermal protection diaphragm automatically closes the valve to prevent gas flow should temperatures ever reach an excess of 200 degrees Fahrenheit. To further ensure safety, durability, and longevity, our natural gas connections are manufactured using only the highest standards of quality. Every box we manufacture is put through full quality control testing. All stainless steel construction provides a corrosion-free, reliable, no-maintenance product. As well as an aesthetically pleasing finish which complements many of today’s modern appliances. The natural gas connection comes with a 1 year unlimited warranty.